Regularly seen in Loch Fyne, as well as other parts of the Clyde and West Coast of Scotland, are the live fish carriers belonging to Sølvtrans AS of Norway, who operate these vessels on contract to Marine Harvest, owners of many of the fishfarms around our coastline. This view illustrates one of their newest vessels, RONJA VIKING, at Portavadie today. 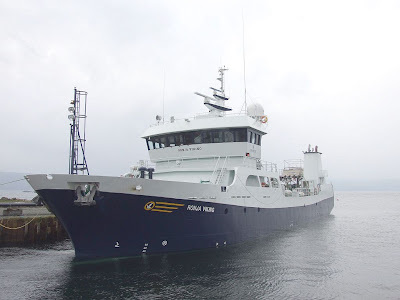 She was completed by Aas Mek Verksted in 2006, although her hull was constructed by the Riga Shipyard in Poland. She is 57.07 metres in length, with a gross tonnage of 1,276 tons and a deadweight of 1,250 tonnes. Hi, regarding the Ronja Viking,she is infact on a long term contract to Lighthouse Caledonia Ltd.
Ronja Viking sighted today at anchor in Rothesay Bay. Ronja Viking sighted today at anchor in Catocol Bay Isle of Arran.